This guest blog post is by Yang Jiao, a Ph.D. candidate at the University of Florida who has been doing fieldwork on Chinese business in Ghana. On May 14th, Ghana's Ministerial Task force led by the President Mahama launched a crackdown on illegal gold mining. It targets any foreigners who operate in small-scale gold mining (or Galamsey as Ghanaians call it). By June 6, 169 Chinese miners were detained and sent to Accra. 124 of them were detained at Ghana Immigration Services and another 45 Chinese miners detained at the prison of Bureau of National Investigations. On Jun 10, all 169 were released and ready to return to China. This is not the first time Chinese illegal miners were detained in Ghana, but certainly the most intense since Ghana’s last election. Large influx of Chinese miners in mineral-rich African countries is rare. But the incident in Ghana points to vulnerabilities in the governance of resources and state control of transnational capital and migration as China and many African countries embrace neoliberal economic policies. Why have 12,000 Chinese miners come from Guangxi province? 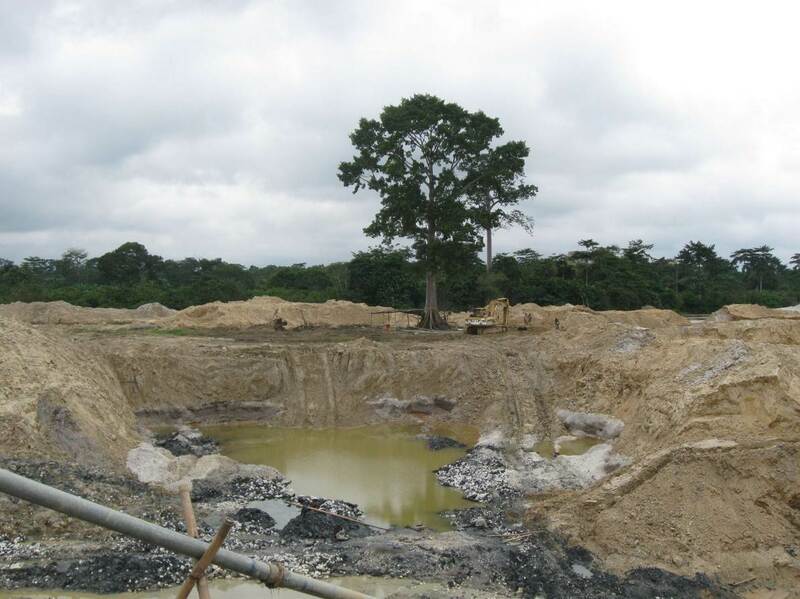 Alluvial gold mining has a long history in Ghana. 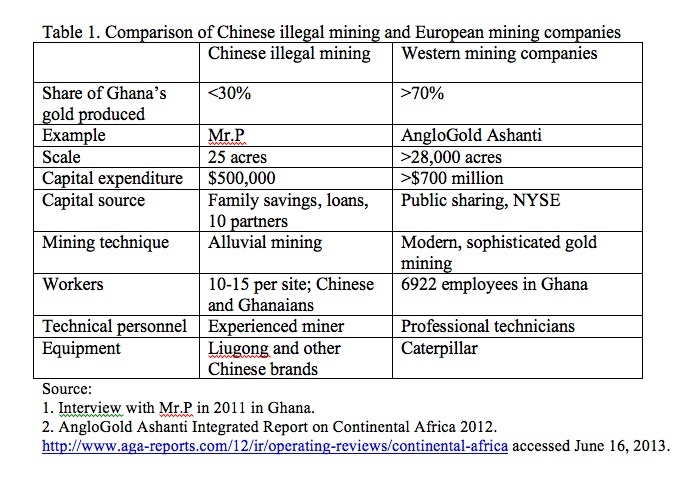 The first wave of Chinese miners came for Ghana’s gold during 1990s when there were very few Chinese in the country. Large numbers of Chinese gold miners arrived around 2010 when gold prices were soaring. The majority of them are from impoverished Shanglin county of Guangxi province. Others are from Hunan, Henan, Heilongjiang, and Fujian provinces. How does illegal gold mining work? According to the Ghana Minerals and Mining Act 2006, foreigners were prohibited from small-scale gold mining on plots under 25 acres. Guangxi miners usually pool capital together from family savings and bank loans or even usury in China to form a small company with an initial capital input of about US$500,000. This contrasts with capital-intensive Western mining companies in Ghana (see Table 1). The arrival of Chinese alluvial miners changed the situation where traditional Ghanaian galamsey rely on inefficient human labor to wash gold sands. Chinese sand pumps helped increase the efficiency of alluvial gold production. Chinese gold mining company would partner with a Ghanaian who holds small-scale mining license and use his company as a front. Chinese miners are both the investor and labor provider. Usually 10% of profits would go to their Ghanaian partner, and some share goes to the local land owner/chief (see Table 2). Guangxi miners import machinery from China and recruit workers from Shanglin or other parts of Guangxi. Many workers have kinship ties or are from the same village in Shanglin county. Rags to riches stories of fellow miners motivate more young men to go to Ghana. Workers usually sign contracts for 2 or 3 years with their bosses. 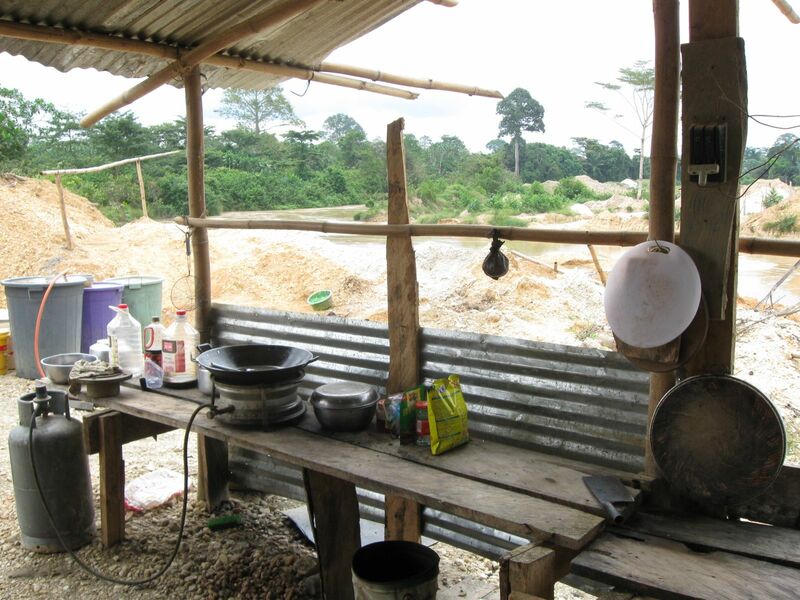 During their stay in Ghana, they are mostly at mining sites with nearly no mobility. Due to harsh working conditions and limited access to medical facilities, many died of malaria each year. How do Chinese workers get in and out of Ghana? Since 2010, it is extremely hard for a Guangxi worker to get a Ghana visa in Beijing. Even with the help of visa brokers in China, getting a visa is quite expensive and time consuming. However, visa brokers in Ghana are able to get on-arrival visas for incoming workers from Ghana Immigration Services by bribing some Ghanaian officials. Some workers would obtain Liberian visas and flight tickets. When they land in Accra, brokers pick them up inside the airport. Some brokers direct them to arrive in Togo first then bring them across border with their on-arrival visas. The visa brokers work closely with gold mining bosses and some corrupt Ghanaian Immigration officers to traffic Guangxi workers into the country. At its peak, more than two dozen Chinese mining workers are sitting on each arriving flight in Accra. When they arrive, they would be taken to the mining sites directly. Their passports are usually kept in the hands of brokers for visa extensions. All workers were on tourist visas and none of them have work permits legally obtained from Ghana Immigration Services. According to one Chinese visa broker who used to work for Guangxi gold miners, he partners with certain Immigration officers to extend visas for the workers. The official cost for a one month extension is 40 cedis, and the broker charges 150 cedis per person. The Immigration officer gets a lump sum of 100 or more cedis per request. For Guangxi workers, single re-entry visa cost about US$200, and multiple re-entry visa within 3 months cost about US$300. Many Guangxi miners only have their visas renewed when they are leaving Ghana. Visa brokers would bribe certain Immigration officers in the Accra airport and negotiate a fixed fine for each worker. These immigration officers usually get an extra few hundred cedis in their pockets. These brokers also reserve hotels and buy flight tickets for Chinese workers. All of these cannot be done without coordinated assistance from the Chinese visa brokers and corrupt Ghana immigration officers. What about environment degradation and violence at the mining site? In the late 1990’s, one Chinese entrepreneur comments, Chinese gold miners would rehabilitate the land. As more gold miners come, they start to pay and delegate the work to local chiefs, who often did not implement the rehabilitation. Digging without proper restoring has resulted in corrosion in the mining regions. After getting rich quickly, some Guangxi miners show off their wealth by purchasing brand new trucks and extravagant SUVs. Exposure of their wealth and vulnerability as foreigners make them easy targets for criminals. After several armed robberies in the mining regions, every Guangxi mining site purchased rifles and pistols for protection. Since Guangxi workers are mostly illiterate and speak no English, there are huge language and cultural gaps between them and their Ghanaian counterparts. In a tragic incident, one Guangxi miner shot his Ghanaian excavator driver due to miscommunication. Last year, a 16-year-old Guangxi miner was shot dead during a Ghanaian crackdown operation. At the moment, hundreds of Guangxi miners are still hiding on the mountains according to Mr.Z, a miner from Heilongjiang Province based in Dunkwa. Impacts of illegal mining on the environment and frequent violence at the mining sites have already brought local resentment towards these Chinese miners. It depends on how effective the Ghanaian government is in enforcing its mining laws, immigration laws and how effective it tackles the corruption problem. It also depends on how effectively the Chinese government curbs this kind of migrant work. However, it is a tough job for any government to monitor and control speculating capital and illegal immigration. The recent crackdown on illegal gold mining offers an opportunity for both China and mineral-rich African countries to learn to tackle this issue together. The two countries enjoy a rather close relationship since Ghana’s independence. In 2012, bilateral trade between China and Ghana is US$5.4bn, increasing 56.5% over 2011. Ghana also signed a US$3bn loan facility with China Development Bank (CDB) to finance nine infrastructure projects. Chinese investment will continue to be an important factor in Ghana’s future growth. I have not heard of large influx of Chinese miners in other African countries. 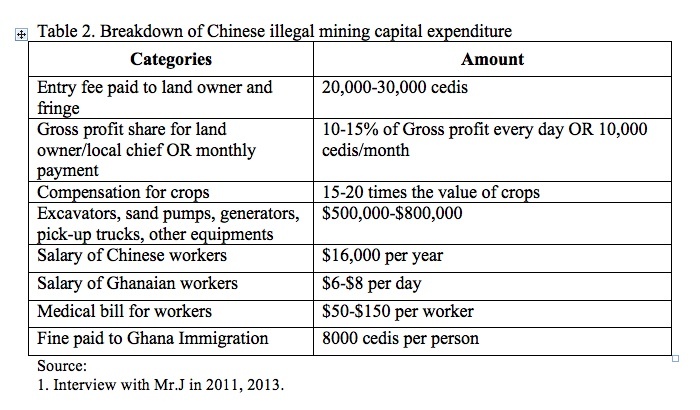 The large number of illegal miners in Ghana should not eclipse the big picture that the majority of Chinese companies and entrepreneurs are investing legally in many sectors such as agriculture, construction, energy, fishing, manufacturing, telecommunications, and wholesale trade. The Chinese migrant population in Ghana is highly diverse in its demographic characteristics, business types and wealth level. The majority live in Accra and Tema and work for state-owned enterprises. 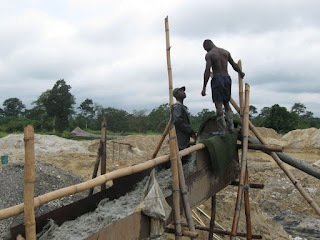 Interviews with Chinese gold miners during my fieldwork in Ghana from 2010 to 2012. Hi Ashlee, good to hear from you. Thanks for this link. CIFOR is doing some awesome fieldwork on Chinese engagement in Africa. They are all bad. Africa should do for Africa. Point, blank, period. Only a fool would believe that these people have Africa's best interest at heart. This is why Africa remains poor. They should have their own mining companies but because their infrastructure is so poor and the governments are so bad they have no choice but to take loans and infrastructure projects in exchange for more or less leasing their land t and its respective resources to the Chinese. Black people need to wake up. Interesting how an article by a Chinese female author attributes the corrupt practices of Chinese in Ghana to bad behavior as supposed to placing the blame where it belongs "on the criminality of the Chinese there." This is nothing more than neo colonialism. The Chinese i Africa is not a good thing.They had helped the Vietnamese in the Vietnamese conflict only to be dispelled by the Vietnamese after an incursion into Vietnam. They look down on Africans and from my experience in the US they open businesses in African American communities but do not benefit anyone their but themselves. They are rude, don't greet or help you and sometimes inconspicuously follow you around the store. China, the US, and Africa: How Many Embassies?